Summer, from October to March, hot days and nights, from 20 to 40 degrees C. Rainy season with only 350 to 700 mm of rainfall per year, on average one day in October, two days in November, three days in December, three days in January, two days in February, one day in March, one day in April, 1 day in May. Lush vegetation, leaves on the trees, grass abundant. Births of most herbivores in the bush. To make provision for your holiday safari in the Kruger National Park of South Africa in the bush in summer, light clothing or neutral khaki shirt & shorts, optional anti-malarial treatment (consult your doctor or use mosquito repellent cream). There are very few mosquitoes at Mopaya and staff at the Lodge have not taken treatment since 2000 and have not experienced any health problems. Winter, from April to September, cool nights and warm days, 5-30 °. Dry season. Usually little or no rain, cloudy only a few days, mostly blue sky. To make provision for your safari holiday in the Kruger National park of South Africa in the bush in winter bring warm clothes with hats and gloves for chilly morning safaris in open 4 × 4s and evenings under the stars. Light clothing during the day. Swimsuits are optional. It is customary to give at least 200 Rand per guide per day, 100 Rands for the tracker and 100 Rands for the cleaning staff, kitchen, service if you want to thank the staff of the Lodge but there is no obligation and gratuities to the discretion of customers. Envelopes are available at the reception. South African Airways, British Airways, Swiss, Iberia, Air France and KLM, AIR CANADA, offer daily flights to Johannesburg every night and the next morning connections to airports at Phalaborwa (PHW) 30 minutes from the Lodge, Hoedspruit (HDS) 60 minutes from the Lodge and Johannesburg (JNB) 6 hours from the Lodge. Check that you have a passport valid for more than 6 months with a whole page for Tourist Visa applied for free and quickly at the airport in Johannesburg. 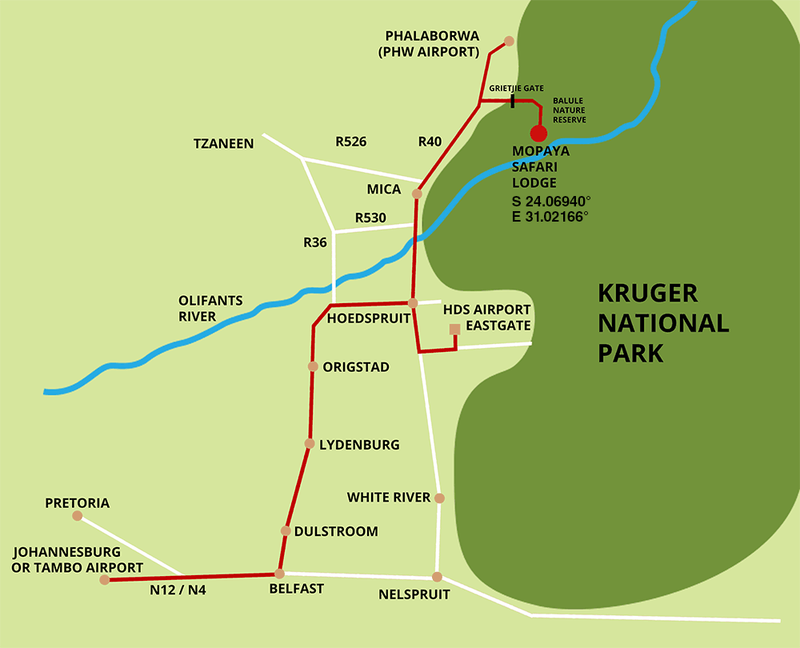 Mopaya Safari Lodge offers transfers chauffeured to and from these airports on request. Extras payment in Cash, Rands or Euros. Thank you to ask your Ranger to stop draw cash in town on the way back from Kruger or another Game Reserve to the Lodge if necessary before checking out. Throughout the year, walking shoes, hat, camera and video, binoculars and plenty of memory cards for your camera because a lot of shots are taken during the Safaris. For reasons of security and peace, most Lodges in South Africa do not admit children under 12 years and some even 16 years of age. At Mopaya Safari Lodge, children 7 years and older are admitted provided they are under the supervision of parents or an adult accompanying them. They should not in any way disturb the quiet tranquillity of the Lodge or other guests. Check formalities for minors with South African Embassy. Ask your tour operator before departing what network is available at Mopaya Safari Lodge for international calls. Should you send your cell phone or smartphone number prior to arrival, the Booking Office will add you on the Mopaya Whatsap Group to let you communicate and call for free with the Rangers during your stay. In case of an unexpected exceptional sighting on the Reserve, the Rangers will be able to inform the guests immediately and an extra Safari should be organised at no extra cost. For safety reasons, because Mopaya is located in a “Big 5” area with a high density of lions and elephants around the Lodge, guests are not allowed to walk on their own and they should call the Rangers or the Security Guards on duty to be escorted if they wish to go from their tents to the Lodge or vice-versa. Passport with at least 6 months validity and a blank page for the tourist visa of 90 days granted to the customs clearance on arrival at Johannesburg airport. Mopaya is not located in an area at risk for Malaria and because there are very few mosquitoes in the summer and none in winter, the Lodge’s staffs do not take any treatment and have not experienced any health problems since 2000. For added protection it is recommend that guests wear longs leave shirts and trousers in the evenings during summer. Biological repellents such as citronella applied to the skin are also very effective. Free wi-fi at the lodge and in all the tents for the guests. Mopaya Safari Lodge provides 220V power points in all the rooms. Converters are also provided in each room. First distribution of clothing and medicine to families living on the outskirts of Kruger National Park and private reserves as part of the awareness on the protection of wild fauna and flora and sustainable development. This exchange is organized with the participation of visitors who wish to make space in their suitcases for medicine and clothing that will be offered to local people. A list of medicines complied by doctors is available below. The beneficiaries of the clothing and medicines are made aware that these products are offered by all who come to see the wildlife and that without animals, there would be no visitors. So it is important to protect their habitats and fight against poaching to keep the sustainable ecotourism jobs. aspirin 500 mg, 500 mg Paracetamol, Nurofen, etc. Clamoxyl – Augmentin Yeast + Ultra. Immodium, Tiorfanor, Smecta, Carbolevure, Spasfon. Voltaren tablets and cream or equivalent. Complex vitamin united daily dose. Each person can bring several bags which can distribute drugs to different families. Thank you in advance for your participation.